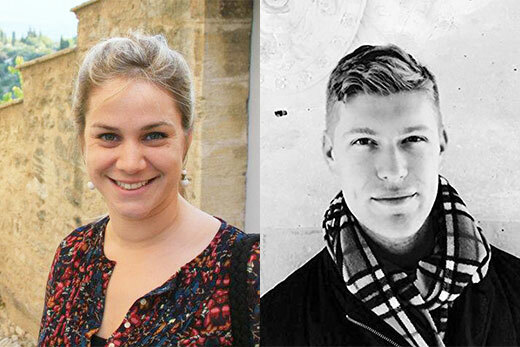 Poets Emily Leithauser, visiting assistant professor in English and visiting lecturer in creative writing at Emory, and Richie Hofmann, who is an Emory PhD candidate and teaching fellow, present a free reading and discussion on April 25. Two poets with Emory connections will present a free reading and discussion on Tuesday, April 25, at 6:30 p.m. in the Stuart A. Rose Manuscript, Archives and Rare Book Library, on the 10th floor of the Woodruff Library. Emily Leithauser is a visiting assistant professor in English and visiting lecturer in creative writing at Emory. Her first collection, "The Borrowed World," won the 2015 Able Muse Book Award and was published by that press the following year. She won the Grand Prize in Poetry at the 2015 Tennessee Williams/ New Orleans Literary Festival. Her work has been published in Literary Imagination, Southwest Review, Blackbird, Measure and Iron Horse review, among others. Richie Hofmann, who is a PhD candidate and teaching fellow at Emory, is the winner of the Ruth Lilly Poetry Fellowship and the 2014 Beatrice Hawley Award for his first collection of poems, “Second Empire.” His poem “Idyll” appeared in The New Yorker. His work has also appeared in Callaloo, Kenyon Review Online, Poetry, The Southern Review and other publications. Nathan Blansett, a second-year student in the Creative Writing Program at Emory, will moderate the discussion. His poems have been published in New South and The Journal.